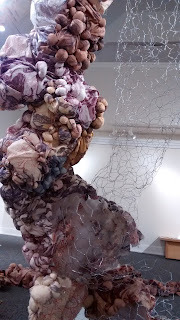 Maria Doering's Art & Adventures: Inside Me - A fabric Installation - the Inverness Arts Centre - Incarnation. Inside Me - A fabric Installation - the Inverness Arts Centre - Incarnation. The Inverness County Centre for the Arts in Inverness, NS, invited me to be part of a fiber arts themed exhibition. The Studio Arts Quilt Associates had the main exhibition space with their "Structures" Exhibition. Fiber Artist Penny Barens displayed her very long stitched Journal in the hallways exhibition space and the small area at the end of the hallway was a exhibition add on by SAQA with process materials explaining how the quilters came up with their projects. Overall a very interesting and strong exhibition series. 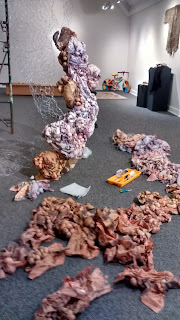 SAQA hoped to have a fiber arts related installation piece in the centre of the main space, which is where I came in. 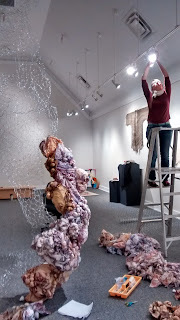 Elizabeth Whalley, the director of the arts centre, made the connection and I was invited to come and set up "Inside Me". 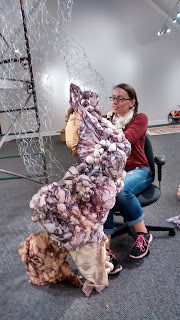 This was a very exciting proposition to me because for the first time I had a space and opportunity to install "Inside Me" in a completely three dimensional way. 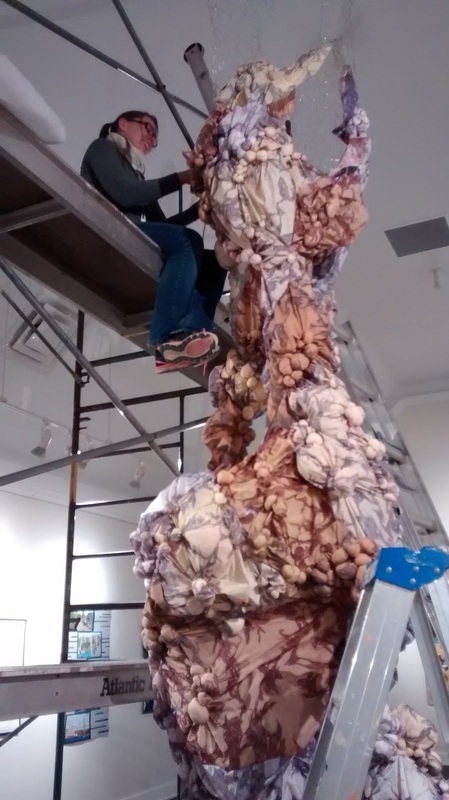 Those of you who have seen the piece before know that it has had incarnations of growing along a wall, creeping up a column, bulging away from the wall in a narrow hallway-like space as well as coming to life in a vast public space, but never was it a structure of its own. Below a series of photos documenting the 3 1/2 days it took to install this newest version. Wednesday, September 23rd, 5:30 pm, I left work after a rather busy and stressful day and began my lonesome drive up to Inverness. I arrived at 10 pm and after a quick inspection of the exhibition space and a lovely chat with Elizabeth I fell into bed. Elizabeth was so kind as to host me during my stay. Thursday, September 24th - 8 AM , unloading the car and ready to get this party started. The ever helpful handyman Richie and I put up the scaffolding after I realized that I would have the structure ready to go in only a few hours. Playing around with chicken wire may be one of my new favorite activities, this stuff is magic! It's so pliable! This is me on the top level of the scaffold, sweating bullets while attaching the chicken wire structure. I am actually quite afraid of heights. Though the cross bars and the top tier frame work helped a lot. And so it begins. 6 hours ahead of schedule I am already pinning the fabric on. I figured this would be a breeze at this rate I would finish much earlier than expected. 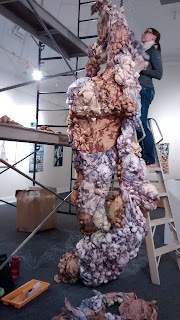 Though I realized pretty quickly that it made a huge difference whether or not you pin the fabric only against the wall vs on a 360 degree structure. Turns out it takes about twice as long and about twice as many pins as expected. By the end of day one I am still feeling good and optimistic though. And this is how far I got. Time for dinner and a quick stroll to the beach. Inverness Beach. What a stunning place! The waves where just beautiful. After dinner I came back and worked until about 11 though I didn't get too much further. Next day, a bright and early 8 AM start. Playing around with lighting a bit. My palette of my own double sided printed and sewn fabric laid out from light to dark. At this point I am already realizing that I am going through pins at a rapid pace. The installation is growing but I am not even half way and I have used more than half of my 3500 pins. 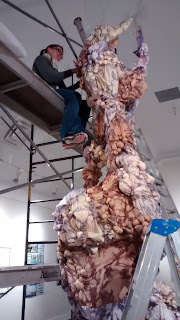 As I am starting to move around between a ladder and the scaffold I am getting a good look inside the sculpture... This is what the inside of the inside looks like. Fascinating! Elizabeth got really excited as well. No one else has ever had the opportunity to look inside "Inside Me". After long hours of meticulous work I have to take a break. Luckily the Inverness Art Centre grounds are breathtaking. Ocean view and the weather was beautiful. 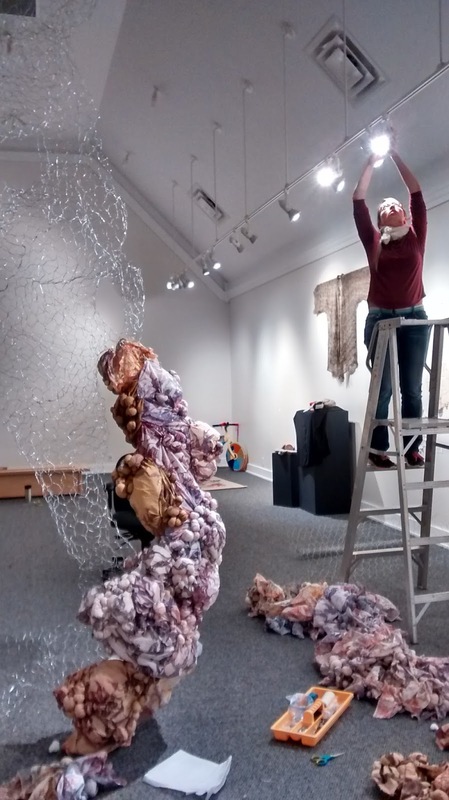 These are knitted pieces inspired by Mackenzie Kelly-Frere windhose projects and were part of a community project "Cast Offs" for the Interlacing Conversations exhibition that was up just last month at the I.C.C.A. I love the way these pieces sail in the wind. And it's growing and growing. 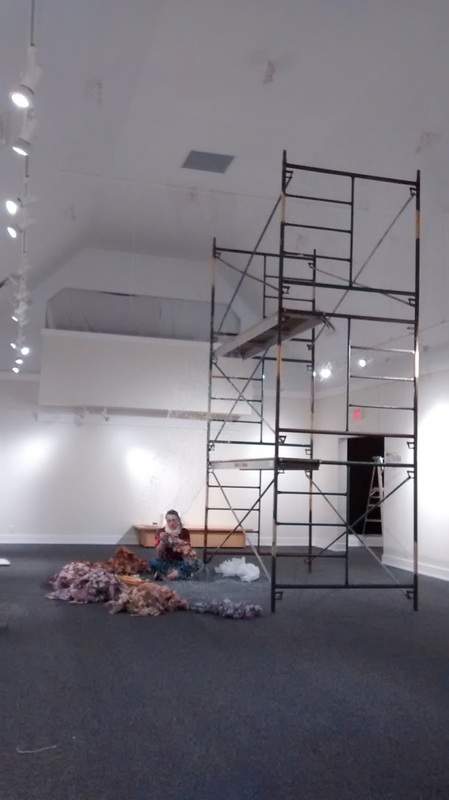 I am happy to report that after so many hours on the scaffold and ladder I was not nearly as scared. The relationship of ones body in a space definitely changes when it is a gradual transition. At this point I realized that I am out of pins. The previous day we had scoured every store in Inverness for more pins and purchased all of the pins that where for sale at the COOP super market. This came to approximately 500 more. But not nearly enough. Now it is Saturday lunch time and I am out. The town of Inverness is overrun with people trying their luck at the infamous Legion Lottery game "Chase the Ace". Traffic is thick and I need to finish this installation. So after calling around we figured out that the grocery store in Mabou, NS has some pins. I hopped in the car and drove on unpaved backroads (to avoid the major chase the ace traffic jam) on a mission to find more pins. Who knew this could turn into such an adventure. In Mabou I cleaned out the supermarket of all ~600 pins they were selling in little packets of 62. That was still not enough. I found a little store near the bridge in Mabou that sells quilts and after talking to the lady she remembered that she had picked up a bunch of pins for a project. Rummaging in a drawer she found 5 boxes that she sold to me at cost. I wanted to hug her. To celebrate my find I stopped into the Red Shoe Pub and picked up the best fish and chips I have had in Nova Scotia. WOW! Thank you Jim Lee for the recommendation. Made it to the top of the scaffold. 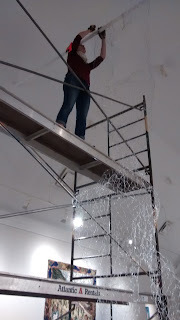 Not long after this point it was midnight and I was so deliriously tired that I had to stop working for safety reasons on the scaffold. I finished off on Sunday morning where I realized I had been 3 pieces of fabric away from finishing completely. Last but not least, finally the piece is done. 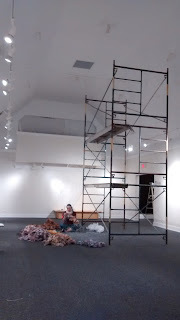 Richie came in Sunday morning to help out and take down the scaffold. The opening reception was a great success I had to do a brief artist talk and all. I was too busy to take photos of it, though some of those may follow in the next few days. Elizabeth may have a few. I also have a few of my pen and ink drawings on display at the gift shop! Thank you to Elizabeth and Michelle who took the photos in which I am present. Thank you to SAQA for letting me be part of the exhibition. A very special THANK YOU to Elizabeth Whalley who burned the midnight oil with me every night. Inverness is lucky to have you! I hope we get to do it again one day! It was wonderful!